Full Face Snorkel Masks Are Deadly Dangerous! 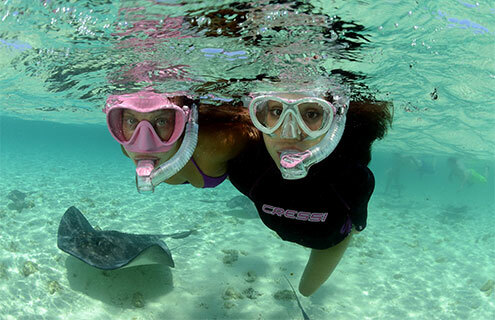 Full face snorkel masks cover the entire face, allowing snorkelers to breathe out of their nose and mouth. They are designed for easy surface snorkelling recreational use which means you are just floating on the surface and looking down at the fish and other marine life, not swimming. If you need to swim against waves, currents, or intensively for any reason, better use normal traditional snorkel gear. Full face snorkelling masks are not designed for leaving the surface to dive underwater, freediving, spearfishing, extensive open water swimming, or swim practice. Soon enough you will feel like you can't catch your breath. This is due to the CO2 build up in the full face mask while you exhaust yourself. If you experience any difficulty, find your breathing heavy, remove the full face snorkelling mask immediately. Dead Space! CO2 Build Up! When we breath in and out we humans produce carbon dioxide (CO2). When we do an activity which exerts us, our body needs more oxygen to keep our muscles working, and therefore our breathing becomes faster. At the same time we breath shallower which creates a problem. Exhaled air contains more CO2 than the air we inhale. If we do this in a closed space, like a full face snorkel mask, we won't exhale deeply enough to push all the bad air out. It's like breathing in a closed bag where the CO2 keeps on building until it becomes very toxic. If you breathe in used air full of CO2 it leads to headache, dizziness, and unconsciousness. That's bad! Now some of the designers of full face snorkel masks say they have taken this into account. Their full face snorkelling masks have a 'breathing part' and a 'looking part'. The breathing part is located near the mouth and looks a lot like an oxygen mask. This part seals the mouth and nose off from the rest of the mask. On the top of the breathing part are little valves which are designed to only let in fresh air and prevent any bad CO2 rich air escape to the looking part of the mask. The bad air is forced to the lower part of the breathing part and flows to and out of the snorkel on the sides of the mask. In some cheap, poorly made and bad fitting full face snorkelling masks the mechanism as described above simply doesn't work. It could be that the valves are faulty and don't work, or the breathing part has a poor fit. The result is that bad CO2 rich air leaks down the sides of the mask. Even if the full face snorkelling mask has been designed well, and made from quality materials, it won't work as designed if it's not properly cleaned and maintained. Poor maintenance could kill you or your loved one! The supporters of full face snorkel masks say that you need to ensure the breathing part fits neatly over your nose and as close to your face as possible. When you put on the full face snorkelling mask and breath using it, only the breathing part should fog up. The looking part should stay clear of any fog. Fogging of the looking part is a danger sign. Never dive underwater with full face snorkelling masks! Yes, you often see photos of people diving underwater with them. Worse, the companies that want to sell the masks use these type of pictures. But this is a BIG NO, they can be used on the surface only. With many full face snorkelling masks you can't equalise by blowing hard and long against pinched nostrils as you descend underwater. Thus you may rupture the round window membrane between your middle and inner ears. The tighter fitting head straps of full face snorkelling masks make them harder to pull off in an emergency. That's not good, and when combined with carbon dioxide buildup causing snorkelers to become dizzy or disoriented, it becomes a potentially lethal combination. It also makes it harder to clear the mask if it floods. Some people have reported that the face area heats up when using full face masks, plus that the masks gave them a feeling of claustrophobia. That's not good! Many people who are buying these full face snorkel masks are inexperienced swimmers, not familiar with the fast-changing weather and water conditions. Beginner snorkelers are more prone to panic or hyper-ventilate in the water. Combining these factors with the problems associated with full face snorkelling masks is dangerous. If you already have a full face snorkelling mask, we recommend you smash it up (so it can't be a danger to others) and put it in the bin. Then get a traditional mask and snorkel combo! Use a traditional mask and snorkel. If you don't have your own snorkelling gear yet, or think you need to upgrade some of it, please take a look at our Snorkelling Guides in the Trusted Snorkelling Advice section of this website. Please also check the great range of Snorkelling Gear in our online shop. For information about properly looking after your snorkelling gear, please see Equipment Care and Maintenance. If you want go snorkelling to see the underwater wonders near Melbourne, please take a look at Snorkelling in Melbourne, and Melbourne Snorkelling Sites. 70% of earth is covered by water. Non diver? I hope you enjoy your 30%.